As it often does, the night sky made me feel small. Struck by the sheer scale of the moon and the stars glittering millions of light years behind it, I was again reminded of my own insignificance. I thought about my own mortality. I thought about how old I would be when the next red “supermoon” eclipse appeared; about how for many people on Earth, last night was their last chance to witness that exact sort of astronomic phenomenon. These thoughts made me momentarily melancholic, but that sadness was then almost instantaneously replaced with a certain joy: I realized that there was something profoundly gratifying about being alive, at that moment and in that space, able to witness and appreciate a starry night like the one before me. I thought about the millions of others who were also pausing in their busy lives to stop and look up, and I felt content in the knowledge that we were all existing together momentarily in awe of the same greater something. I breathed deeply of the cold night air, and I held Snoopy’s hand, and I was grateful to be present in that moment with him. I felt a giddy excitement about what the future might hold for us. We don’t know what kind of night sky inspired Vincent van Gogh’s “Starry Night”, but I like to imagine that it was the same kind of deeply reflective, emotional awe and sense of connection with the universe that inspired him to pick up his paintbrush and create a nightscape of exploding stars, shifting clouds, and dizzyingly bright crescent moon. 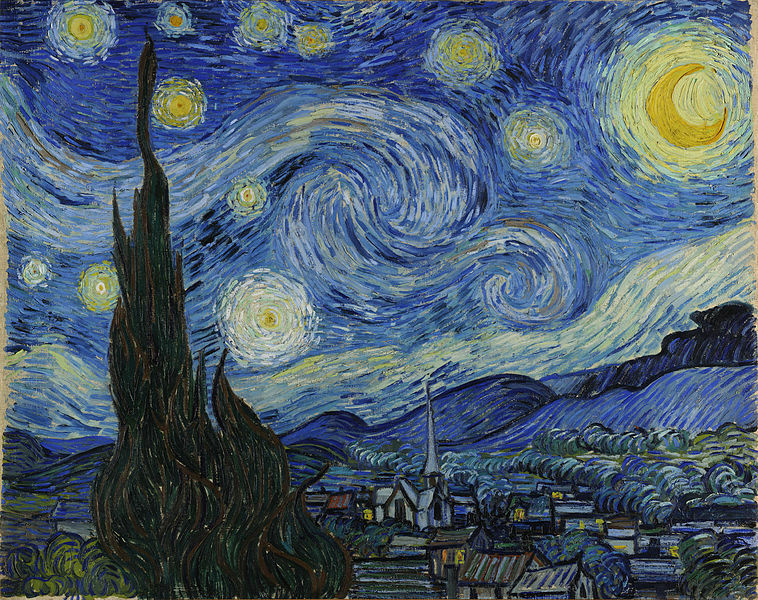 One of the most famous examples of the Post-Impressionist period, “Starry Night” epitomizes the use of art as a vehicle for expression of the emotional relationship between artist and subject. Discarding earlier artists’ rigid need to realistically document the appearance of a subject on the canvas, van Gogh and other Post-Impressionists advanced the idea of using abstract line, shape, and colour to convey thought and feeling. Van Gogh’s hope was to paint in a way that communicated the intimate array of emotions that his subject evoked, regardless of form. There is no better example of Van Gogh’s Post-Impressionist style and theory than “Starry Night”, which depicts a star-filled sky with a series of brightly coloured swirls and heavy brush-strokes, over an embellished skyline partially inspired by Van Gogh’s own hometown. Van Gogh’s “Starry Night” is no faithful documentation of any actual starry night that any person has ever witnessed on this Earth, but it is an evocative exploration of the relationship between the artist and the cosmos that conjures the same feelings familiar to all of us who have taken a moment to pause and look up at the stars. Post-Impressionism — particularly as Vincent van Gogh imagined it — was all about shifting the focus of art away from documentation and more towards emotional expression of the relationship between artist and subject. So, it was with profound sadness that I visited the Modern Museum of Art last weekend, where I was able to see van Gogh’s original “Starry Night” hanging modestly in a gallery surrounded by scores of other Post-Impressionist masterpieces. There I saw so many people seeing “Starry Night”, but so few really seeing it. An unceasing clamour of tourists were crowded around “Starry Night”, each jostling for position in front of the painting. As soon as each made their way to the front of the pack, they whipped out their camera-phones, and snapped a picture or a selfie. With the click of the digital shutter, most walked away with faces buried in the tiny screen of their smartphones as they reviewed the series of snapshots they had just taken, searching for an “Insta-worthy” one. I was struck by the irony: here was one of the landmark paintings to argue forcefully for the rejection of art as the simple pursuit of straightforward documentation, and in favour of the development of a deeply personal, considered, and emotional relationship between artist and subject; and yet so many viewers were celebrating “Starry Night” by doing exactly the opposite. I couldn’t help but view the throng of MOMA visitors as a microcosm of how most of us unfortunately relate to the world today. Our smartphone cameras are supposed to ease the process of documenting our lives, but have we become too reliant upon our digital devices to emotionally filter the way we are present in the world? How can we forge an emotional connection to the world around us when we’re so distracted by the process of digesting what we see into digital form for others’ consumption? Can the megapixellization of our memories truly substitute for a deeply personal moment of reflection and insight? What are we missing when we strive not to miss a thing for our “pix, or it didn’t happen” culture? Are we hiding behind the safety of our smartphone screens, comfortable to allow digitization to blunt the emotional edge of really living in the moment? Are we so busy Instagrammaing and hashtagging our lives online, that we’re spending less time experiencing it? How often do we find ourselves looking down at a backlit screen as a magnificent starry night dances above our heads? Last night, I chatted with my sister who expressed a certain sadness that at my wedding last month, she hadn’t had time to take a family photo with herself, her husband, and their daughter to commemorate the occasion. I listened to her as the lunar eclipse passed above my head, and we collectively realized that there was something much more precious about both of us having had so much fun at the wedding — dancing, drinking, laughing, and just enjoying our presence in the company of new and familiar family and friends — that we didn’t want to interrupt it all by taking a picture of it. Later, I hung up the phone and watched the Earth pass like a dark red shadow before the moon, and I lost myself in contemplation of the beautiful effort of trying to live present in each moment that life grants us. And, I don’t think I missed a thing by not taking a picture of it.